Though there has never been a da Vinci recall affecting the da Vinci Surgical System itself, there have been several recalls for instruments and components used with the surgical robot. So far, most of these issues have not been associated with serious patient harm. But they have added to concerns about the safety and efficacy of the Da Vinci robot. https://www.rxinjuryhelp.com/wp-content/uploads/davinci-recall_ib.jpgIn December 2013, a da Vinci surgical recall was issued for certain instrument arms used with the da Vinci Surgical System. This was a Class II recall, which the U.S. Food & Drug Administration (FDA) says indicates a product has the potential to cause temporary or medically reversible complications. No patient injuries were associated with this recall, and affected components were not pulled from the market. 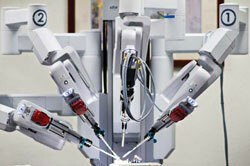 Rather, facilities with da Vinci robots were asked to schedule inspections with Intuitive Surgical so that any needed repairs could be performed. This da Vinci surgery recall was issued after Intuitive Surgical received reports that some of the arms could stall. This posed a risk of patient injury should a surgeon attempt to push through the stall, thus causing a “sudden catch-up.” While no patients were injured because of this problem, the company did receive a report of an imprecise cut that resulted from a stall and catch-up. Approximately 1,300 robots were affected by this da Vinci recall. If you would like a free case review and would like to speak with an attorney, please contact us now to go over your potential claim. In November 2013, Intuitive Surgical issued a da Vinci recall for certain models of Large Needle Driver and Mega Needle Driver Endowrist Instruments. The recall was announced after the company found that the instruments were associated with an elevated rate of detachment of a small metal piece known as the jaw insert. According to Intuitive Surgical, there were just over 100 complaints relating to the Endowrist instruments, one of which required a patient to undergo a second operation to retrieve a detached jaw insert. All of the instruments affected by this issue were manufactured prior to 2011. The FDA also designated this a Class II recall. This da Vinci recall was also deemed Class II by the FDA, and again no patient injuries were reported. Intuitive said it was able to retest the instruments in the field, and all passed those inspections. In May 2013, Intuitive Surgical sent its customers an Urgent Product Notification regarding some issues with certain models of its EndoWrist Hot Shears Monopolar Curved Scissors that could result in patients suffering burns. Though this was never classified as any type of da Vinci surgical recall, Intuitive did provide replacements for the affected instruments. The notification was issued after Intuitive Surgical became aware that some of the Hot Shears Scissors could have micro-cracks that might allow electricity to leak from the instruments. According to the company, these micro-cracks would not be visible to the naked eye. Intuitive did receive a patient injury report that occurred in a procedure where the hot shears were found to have micro-cracks. But the company said there was no evidence to indicate electricity actually leaked from the instruments.